Does anyone find it weird at all that this nice, harmonic pop is coming from these three tough guys? Is this sweet boy garage band sound about some kind of reliving fake history with a new generation? I mean it sounds so freaking close to some of the bands from that era. Late '50s, '60s, parts of Beach Boys harmony rock, the dirty Kinks, The Mummys....why is this sound still so classic and relevent? And are the only guys into this sound are the ones who know that history? I mean I guess I like that you could subversively get your parents to listen to this and they wouldn't tell you to turn that racket off. Just knowing that makes me a little nuts. How do they make this cool? It's some kind of perfect storm of musical elements. The simplicity of a 3 piece, a verse/verse chorus, slight distortion with harmonized vocals. I guess that's never going to go away and this garage pop sound actually isn't a dirty word, it's kind of been redefined by bands like these guys, Nobunny, Pujol....the list these days goes on forever. In their description it reminded me of how these guys would have looked 10 years ago...or even for that matter how this came out of the Busy Signals. Now that I listen back to that self titled LP and they had a pretty extreme garage pop sound. When I finally got to it, it ended up preparing me for Blood Visions. I was probably into Sufjan a little too much, but I kept throwing them on because it was always fun and deceptively simple, like the Ramones, I just wanted to hear it again. Once I wore it out I wanted more - a new version of that power chord punk, and Jay took that place. I'm glad to hear these guys are continuing this thread into today. GAMES are made up of ex members of BUSY SIGNALS and GENTLEMEN JESSE, but to call them a powerpop band would be missing the point. These guys are mining sounds that predate that stuff by a good 5-10 years. Yea, its the kinda stuff that would later influence 'powerpop' (Greg Shaw recognized this early on when he reissued Rockin' Horse on his Voxx label) but there are no skinny ties and Rickenbackers. Instead, Games are tackling maturer themes with a slightly darker approach to pop. You'll also notice a few glam undertones as Games' seem to be genuinely interested in exploring all 'pop' can offer rather than repackaging / remarketing any one style. 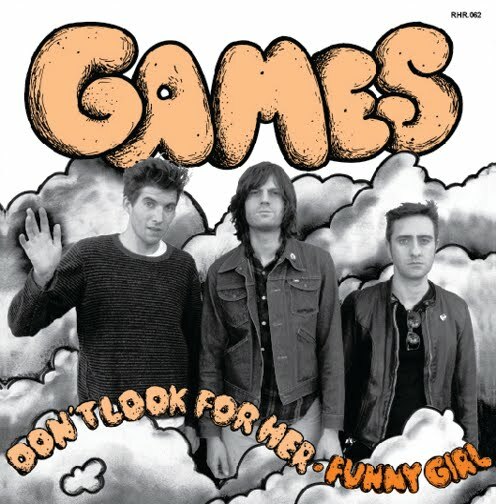 Rob's House is pleased to release Games' debut single. there's a fourth guy though. Sounds very cool. Will check out.